We have been drawn into the BBC2 television programme 'Classical Star'. I'm not altogether surprised at the lack of coverage it has received from the blog world, many appeared to be hostile to the whole idea, prior to transmission. I must say that we weren't intending to like the programme, but, are now keen to see the outcome. But, it has been highlighting some interesting areas. Last week the contestants had to play to a 'hostile' audience, made up of peers, with no knowledge or interest in classical music. All the performers managed to win over the audience with varying degrees of success, and it was an interesting process to observe. As one member of the audience pointed out, he 'didn't even know that classical music existed,' until his involvement in the programme. The fact that he, and many others, may well have been exposed to a new area of music, can only be a good thing. The judges, and Matthew Barley, have all been doing a good job. It's a very difficult task to observe, and find faults, with such young performers. Sometimes their job is easy, and other times, a lot of thought has to go into each decision. All the judges, Charles Hazelwood, Jason Lai, Chi-chi Nwanoku and Steve Abbott, have made very good points and brought different perspectives to their decision making process. Whether that be musical ability, content, stage presence or sheer commercial appeal. Our interests obviously lie with Ian Watt, the 16 year old classical guitarist. What a position he finds himself in. He has an obvious passion for the instrument and his technical ability is excellent for one so young. He also appears to be blossoming under the 'Academy' situation, gaining confidence with each week. Last night the focus was on recording. The pressure mounted for each participant as their hour in the studio got closer. Recording requires a completely different mindset, and, is one that most of the candidates will have had little experience. Having observed the process, at first hand, many times, I could understand the agonies they were going through. There really are no hiding places when notes are recorded, and to try and put across the excitement of a performance, in a recording setting is a difficult one. The guitar is also notoriously difficult to record, but, Ian appeared to get down as much as he could in the required time. It is difficult to assess each individual when only hearing such small snippets of each performance. But the judges will be getting a much better overview of each contestant than we are privy to, and fortunately, they seem very able to see and hear each contestant objectively. This will always be an issue when broadcasting a weeks worth of 'living in the Academy' into just one hour. It is also very difficult to compare different instruments. The piano and the guitar, and to a lesser extent the violin, all require multiple note playing, whilst the saxophone and bassoon are strictly monophonic. Factor in sound quality and the necessary 'star' quality these students will require, and there are some difficult decisions to be taken. 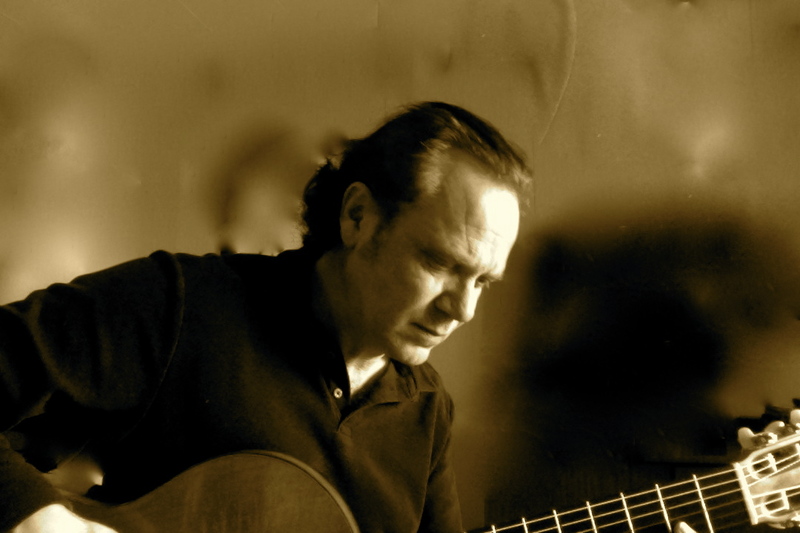 The classical guitar has an up hill struggle in the concert environment, as peoples' perception of the instrument is very different to, say, the violin or piano. Fortunately, the judges were able to hear Ian's potential and he has made it through to the next round. We shall continue to watch, and hopefully, the aims of the programme will be achieved. It remains to be seen whether a 'star' can be found, but, at least the programme has introduced some people to the area of classical music, and also highlighted the dedication required to attain mastery of an instrument. Rumour has it that in medieval Germany, musicians who played poorly, were subjected to the public humiliation of the 'Shame Flute'. The poor musician was forced to wear a mock instrument, with their fingers clamped in position, whilst they made a public apology to the music! Music was obviously taken very seriously, and I would love to find out more about this. I can't help wondering who made the decision about the musician's ability. Did the audience take a vote at the end of each concert? Was it related to a sort of primitive clapometer? Could the system be abused to humiliate a rival soloist? Whatever the history, the fact that music was held in such high esteem, is a great thing. I can't imagine having one's fingers clamped would help very much with any future performances. Robin has, for many years, kept a notebook in which he writes any quotes, or thoughts that he hears, and feels inspired by. It proved invaluable when writing 'The Guitar Gymnasium', and he often refers to his notebook when trying to stress a point to students. It is constantly evolving and is carried around in his guitar case at all times. About a year ago, Robin gave me a beautiful handcrafted notebook, designed by Laurel Burch, who very sadly died in September. The notebook is so lovely that I took some time to decide what I should use it for. In the end I settled on starting my very own book of quotes. They come from many sources, and the only requirement for inclusion to the book, is that the quote moves me in some way. Whether that be to make me think, laugh or cry. Here's one quote that has been in my notebook for some time, and one that I felt was highly unlikely to get to use, but, it made me laugh. "Never trust a man who, when he's alone in a room with a tea-cosy, doesn't try it on." You can see why I was amused, but also, why I didn't feel I would ever find the perfect time to use it. Well, at the weekend I did. I was at my brother's house attending my niece's 5th birthday party, when I wandered into the kitchen. What did I find, but my brother standing in front of the teapot, with the tea-cosy on his head. Quick as a flash, the Connolly quote sprung to mind, and with great delight I was able to pass it on to my brother and his wife. They were suitably surprised, a little shocked, but highly amused, and in full agreement with Billy's sentiments. A little later, once home, I was telling Robin about my good fortune, and he was delighted that this opportunity had arisen. What has all this got to do with music? I am just so pleased that my book of quotes has started to become as useful as Robin's. As we watched Paul McCartney the other evening, a memory was triggered for Robin, which I felt worthy of repeating. It occurred as McCartney was playing 'I Saw Her Standing There', which he performed with his usual brilliance. Robin said, "That's what I played with Deep Purple, at the audition." I couldn't let that go and immediately went into 'blog' mode. Robin was called down to Pinewood Studios for an audition for the place of lead guitarist, in a post Deep Purple band, put together by Jon Lord and Ian Paice. The position had become vacant after the untimely death of Tommy Bolin, a fantastic guitarist who had played on one of our favourite recordings, 'Spectrum' by Billy Cobham. So it was a pretty nerve wracking experience for Robin. They started with, 'I Saw Her Standing There', and then went on to play, 'Palace of the King', by BB King. The other band members then went off to deliberate, and returned promptly, to say Robin had got the gig. They went on to do a demo of 'Palace of the King', and you can hear it today. For now you can hear 'Palace of the King' from the player in the side bar. Robin has been hard at work all day and I have been out. But we couldn't let the day pass without commenting on two very different situations. The first, is the news that Russell Watson has had to endure brain surgery, a second time, for a recurring tumour. At the time of writing, here, in a report by Veronica Schmidt, is the latest news. It appears that Russell's condition has moved from 'critical' to 'stable', which is fantastic news. If you want to watch a video of Russell and Robin, then you can do so, right here. Be sure to think very positive thoughts, and hopefully, we will see Russell making a full and speedy recovery very soon. On a much lighter note, did you see the fabulous concert last night? Oh how we wished we'd been there. However, you can see some extracts, on the 'BBC electric proms' site. Why is it that students of any musical instrument seem to dislike the idea of practising scales? They are often viewed as a chore, and something to 'get through', before more interesting practice can be undertaken. But all students need to understand the benefits they will gain, by dedicating a section of their daily practice routine, to this essential task. "The practice of scales enables one to solve a greater number of technical problems in a shorter time than the study of any other exercise." So, on the classical guitar, and any other instrument, students really need to start viewing scales as their friend rather than their foe. From this example, you can see how uniform the sound waves are, equally spaced, and each note separate and distinct. This looks very different because there is an awful lot going on! It is the wave form for a rasgueado. The waves are larger due to the increased volume, but, you can also see that so many notes are being recorded in the same fraction of a second, that it's hard to distinguish each individual one. Robin is an advocate of 'silent practice', and, 'hearing' the notes in one's head a split second before playing them. Now, you can keep these sound wave images in your mind and try to 'imagine' the regular and even form that your scales should take. The other day we put a track on the blog, 'Fast Forward', which has proved very popular. We decided to put another track on today, of Robin, and his band 'Hooper'. This one is called, 'Wizard of Waukesha', named after the 'Wizard' himself, Les Paul. Les Paul was inspired to take up the harmonica, aged 8, by a Waukesha ditchdigger, but Les Paul's interest was the electric guitar. He was hugely influenced by Django Reinhardt, and went on to make a name for himself as a brilliant jazz guitarist. Les Paul was a pioneer of the music industry, experimenting with multi track recording, and inventing the solid-body electric guitar, Les Paul. You can clearly see, in this picture, Robin playing his Les Paul guitar. It was with great delight, that on one of Robin's recent visits to New York, he saw a poster, in the window of a Manhattan jazz club, advertising that Les Paul regularly performed there. It's amazing to think that at the age of 92, he is still out there, entertaining audiences. Unfortunately Robin was due to fly home that day and therefore didn't get to see him. But, Les Paul, was the inspiration behind this piece of music. Listen out for one of Robin's specialities, the super fast, pizzicato, rhythm playing. So sit back and enjoy Hooper playing, 'Wizard of Waukesha'. For now you can hear it from the player in the sidebar. Robin now, at last, has a spell at home, which we are all very pleased about. He has quickly settled back into family life, aided by the fact that it is half term here, so both boys are around all day, and eager for his attention. Today, however, he had to go over to Leeds. His students at Leeds University, have been very patient, and it is the first time he has seen them this semester. Robin has just not been here, as he has been away so much recently, giving concerts in a variety of places. But, the course at Leeds is a performance one, and who better to guide potential classical guitarists, than someone who is actively out there doing it. It's one thing to read about performance, and, another thing completely, to be up there on the stage. So often you hear of teachers who never even pick up a guitar during lessons. It makes you wonder how on earth they put across any information. So Robin has put his students through their paces and is now back home. One thing Robin has been desperate to get on with, is some recording, and now, there appears to be a window of opportunity. His time away hasn't been wasted though. Many of the pieces he currently performs will be recorded, and, he has been working on many others. There are also a few surprises up his sleeve which I hope to tell you about as we go along. The timing, as always seems to be the case, isn't perfect. Two small boys around the house all week doesn't make for the quietest of environments. Robin has now returned, and looks remarkably well, despite his long journey. He whiled away the 7 hour wait at JFK airport by taking a stroll past some of the shops. Not only did the lady in the toy shop recognise him, but, she also banged on the window as he passed, to say hello! Is there some sort of covert, classical guitar appreciation society, in New York, whose head quarters are based at the airport? After all the excitement of shopping, Robin found himself a wi-fi spot, logged into the blog, and brought himself up to date with what he's been doing for the last week. Eventually it was time to board. A quick last 'phone call home, then an hour on the tarmac, waiting 40th in line for take off. They got under way, and Robin spent the journey sitting next to a nice young lady, with a very small baby. The baby promptly vomited all over the poor woman, but it broke the ice, and Robin reassured her he was very used to children, and their less endearing tendencies. The guitar concert went very well, and I trust the passenger Robin met, who expressed a passion for a certain composer, enjoyed the Dowland! Robin has now arrived in New York, is in the process of leaving the QM2, and, is very keen to start his journey home. He has a lot of hanging around to get through before boarding the plane, but, is enjoying being on dry land, and the weather, which is warm, if a little humid. I think he'll get a shock when he arrives in Manchester to find it rather colder than he has got used to. He has already planned a trip to the toy shop at JFK airport, and it will be interesting to see if the assistant remembers him again, as she did last time. For Robin, a day without the chance to practice, is very frustrating. He passes the time by working on his computer or listening to music, but, what he really wants, is to get home. I'm sure this is the same for any traveller, keen to return to family, and not relishing the prospect of an overnight flight. "Pleasure is beer, misery a long journey." This is Robin's last full day at sea as the QM2 is heading towards New York. 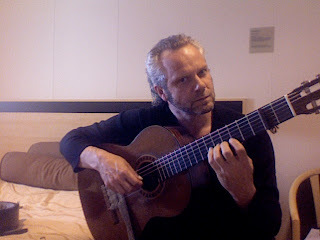 It is also the day of his second, and last, classical guitar concert. The performance is this afternoon, but, due to the now quite significant time difference, it will be tomorrow before I report back. Robin was up early to get on with his practise, and if you look closely, you will see he is using the 'sock' technique. Yes, it is simply that, a sock stuffed under the strings to dampen the sound and prevent waking your neighbours! He did take some time out again last night to watch a film. Not one to stray too far from music, he watched the film,'Bride of the Wind', which, although it has been on release since 2001, appears to have passed us by. It is a film about Alma Mahler, her marriage to Gustav Mahler, and her many passionate affairs with some of the most talented artists of her time. Robin thoroughly enjoyed the film, and, we hope to be able to watch it together soon. Last night Robin went to the theatre on board the QM2, to watch a performance of, 'Great Expectations' by Charles Dickens. The entire novel had been condensed into a 53 minute long stage version, and the actors, all from RADA, gave first class performances. He was able to tell some of the cast what a good job they had done when he saw them later in the evening. Whilst out, Robin was approached by a passenger, that had enjoyed his first guitar concert, and, wanted to know when the next one was. He informed him that it is on Thursday, (not Friday as I mentioned the other day...oops! ), and they got talking. The passenger was keen to know what was on the programme. So Robin mentioned a few names, and when he got to John Dowland, the gentleman became very enthusiastic. They chatted some more before they went their separate ways. He went back to his room, had a rethink, and shuffled the programme around so that he could include John Dowland's 'Melancholy Galliard', and, 'Allermande'. The passenger will probably never know that a chance meeting, and his passion for Dowland, prompted an entire re-write of the programme! Yesterday, Robin recorded an in house T.V. show which was broadcast today, on the QM2. I assume, he was discussing his next classical guitar concert, which is on Friday. Today being Tuesday, means he has a few days off, before his next performance. However, it doesn't mean that he will be putting his feet up, and relaxing. Scales and arpeggios have to be done, whether there is a concert that day, or not. He will also be running through the programme at least once a day in preparation. As the clocks keep changing by an hour every day, he finds himself waking at his usual time, but, discovering no one else around. He did, very thoughtfully, decide not to start his practise until a more reasonable time of day, and took himself off for a walk instead. Here, back in the UK, there has been a lot of talk, both in the papers, and the blogosphere, about a new T.V. programme which starts tonight on BBC2, at 9pm. 'Classical Star', aims to find the best classical musician in this country, under the age of 20. Those involved in the making of the programme, hope to also promote classical music generally, and highlight the dedication required to master an instrument. To learn more about it read James Rampton's article, 'Classical Star: The next generation tunes up for stardom'. I will try and watch it, as a classical guitarist called Ian, has made it to this stage. It is such a rare sight to see anyone play the classical guitar on television, that it will be worth watching, for that reason alone. All contestants needed to have attained a Grade 8 just to apply. But to perform in public requires more than a certificate. I just hope they have the charisma to pull it off. An artists perception of their performance can be a strange thing. I had a message from Robin after the first of his guitar concerts yesterday on board the QM2. He was very pleased with how it had gone, but, wasn't sure how the audience felt. In my 15 years as the, 'wife of a musician', I have frequently been surprised by such comments. For many of those years, I travelled with Robin, either when performing as a soloist, or, with the Hill/Wiltschinsky Guitar Duo. Usually I would sit in amongst the audience, and enjoy the concert, and even more, enjoy the applause at the end. I would then be very surprised when I went back stage to find the duo, quite sure in their minds, that the audience hadn't enjoyed it. I would be incredulous, as I had heard the comments, and the applause with my own ears. I think there are a few factors at play here. One, is that often the artist on stage, doesn't always have a clear view of the audience, as the stage lights are so bright. This can make the whole scenario seem rather strange. You can hear that the audience are there, and maybe see some of them, but unless you have sneaked a look prior to going on stage, or been told, (usually by me), then it's difficult to assess once you've taken up your position. Also the acoustics play a part. Often the whole point of the positioning of the stage, and amplification if used, is for the audience to hear well. The artist may have a monitor to hear themselves, but, not to hear the audience. Some venues therefore have a strange acoustic, which doesn't always let the artist hear the audiences reaction, in the same way that the audience themselves hear it. There is, of course, also the psychological factor to account for. It's a lonely place up on stage, and if the other two points I've made occur, then it will colour any artists perception of their own performance. Luckily, Robin knows all this, and generally, it isn't a problem. Nor was it a problem yesterday. He merely mentioned being unable to 'read' the audience. My return message suggested he wait and see if there is any feedback. The audience obviously loved it, as every time Robin has left his room since the concert, he has been stopped by a passenger, and told how much they enjoyed it. Also, the Cruise Director must have been happy, as he has asked Robin to do a 'special' slot for some VIPs. Luckily Robin isn't adversely affected by these issues now. He understands the factors at play, when on stage, giving a concert. Musicians are highly critical of themselves, because they feel so passionate about their work, and I feel it is experience that is required to gain the confidence needed to overcome these aspects of performing. Robin is now on board the QM2, and preparing for the first of his two classical guitar concerts, taking place later today. It appears that Ramsbottom the cat, quite liked the idea of a trip to New York, and was prepared to stowaway. As you can see, the case hadn't been fully 'unpacked' from the previous trip, but it hardly seemed worth bothering. In case you are interested, the book you can see is, 'Dr.Jekyll and Mr.Hyde and other stories', by, Robert Lewis Stevenson. Robin did repack the book as he hadn't quite finished it. I do have a slight concern over his choice of reading material. We should be alright as long as the weather remains good, and therefore no bouts of seasickness follow, requiring long periods of isolation in ones room. Cabin fever and Jekyll and Hyde may just push Robin's sanity to the limit. As for the hairdryer in the background, well, I must admit that it's mine. I'm afraid I'm one of those annoying people that just leaves it on the floor instead of putting it away. My job is an easy one today, which is probably a good thing, as we were all up very early running Robin to the airport, and, I have finally given in to a rather nasty cold. A few weeks ago, Robin was approached by Ben Clapton, over on 'Music Practice Tips', to write a 'guest blogger' spot. Robin was only home for 8 days, so, I quickly set him the challenge. Ben's site is proving a popular one, with his 'daily source of practice tips and inspiration', and Robin's job was to discuss his approach to classical guitar practice. This he has done, and today you can read the full article, here. Much of the information can be found in Robin's book, 'The Guitar Gymnasium', so, if you feel inspired after reading the article, find a copy and get down to some serious practice! A day of preparation and packing for another trip abroad. However first Robin had to go and buy a new suitcase. His old one, which he hasn't had that long, was beyond repair. Some months ago the lock was broken by an over enthusiastic security guard, and, since then, has been held together with a Savarez guitar string. See a previous post, 'The Many and Varied Uses of Savarez Guitar Strings...', for other applications of the many thousands of used strings we have. But, on Robin's last trip, the handle of his case also broke, beyond repair of even the strongest guitar string, hence the need to purchase a new case. That is now done and all I have to do is fill it with clothes. Robin meanwhile took himself off to the recording studio to try out a new flamenco technique he's been working on. He recorded 'Zapateado', by Sabicas, to put his new hand position through its paces. Recording yourself, and then listening back, is an excellent aid to improving technique and interpretation. It's also a great way of immersing yourself in your music to try and forget the prospect of yet another flight. Robin performed a lunchtime concert today, and, was home by mid afternoon. The venue was full with a very appreciative audience and it was an eventful programme. Robin introduced Roland Dyens piece, 'Tango en Skai', as, "Composed by a Parisian but very much an Argentinian tango, and if anyone wants to dance, then feel free." He then went on to perform the piece with such gusto that his false nail flew off. Robin continued playing, watched where it landed on the stage, and superglued it back in place whilst the applause rang out. Flying nails aside, Robin had the chance to talk to a few members of the audience after the concert. He was surprised to see his old geography teacher, and, very amused when he asked Robin to sign a CD. The teacher obviously had no idea 40 years ago, when he threw a board duster at the unruly schoolboy, Robin, that today he would be asking for his autograph! At least Robin was able to tell him that his knowledge of geography has been greatly improved with the extensive travelling he has undertaken. For all of us at Hillhouse, it's certainly a rare treat, to have Robin home the same day as a concert. It's a sad reflection on Arts funding in the UK that so much of Robin's work is undertaken abroad. Whilst taking a break from his guitar practice, Robin found an old cassette, which brought back a lot of memories. It was the recording of a jam session, in 1984, with one of his bands, 'Hooper', in which Robin is playing his aluminium necked Travis Bean guitar. (As played by Stanley Jordan). With the exception of Tony Relph, who very sadly died a few years ago, all the other band members are still actively performing. In fact Julian Gregory and Peter Willmott are both members of the BBC Philharmonic Orchestra, and Julian Gregory is also a member of the progressive rock band, 'Strangefish'. There were four tracks on this particular cassette and we decided to put one on the blog today. Whilst the sound quality isn't good, you have to remember it wasn't designed to be released, and has been taken from those old fashioned things called, 'tapes'. However your ear will adjust quickly. All the tracks are Robin's compositions, and the one you can hear today, is called, 'Fast Forward'. What I found interesting as I listened, and as Robin explained the piece to me, was that whilst the basic themes and structure were pre-composed, there was much space for improvisation. As the piece progresses you can hear the virtuosic interplay between the violin and the electric guitar, which is all improvised. Robin plays a theme and Julian replies. Robin plays faster, Julian plays faster. All held together with bass, drums and keyboards. It would be very exciting to record this piece again using the equipment that is now available. But for now, I hope you enjoy, Hooper playing 'Fast Forward'. Whilst I repair a problem you can find it in the player situated in the side bar. It is important to nourish the mind not just musically, but, through all the arts. Robin has almost as many books about artists as he does musicians. He also is a great believer in reading, and, has a particular fondness for poetry. His current companion is a book of selected poems by Ted Hughes. Hughes was born in Mytholmroyd, West Riding, Yorkshire, and spent some years living in Mexborough, South Yorkshire. Maybe this contributes to Robin's enjoyment of Hughes's poetry, as they are areas with which Robin is very familiar. Today's favourite, which we both read, was, 'Sketching a Thatcher'. The poem gives such an incredibly vivid and descriptive portrait of the thatcher, that it is impossible not to have a clear image in your mind within just a few lines. It's no coincidence that artists, traditionally seek out each others company. Be they poets, authors or musicians, their relationship is highly symbiotic inspiring each other to new artistic heights. As we all prepared to go out, Robin settled at the piano for a quick blast, to let off some steam. After such an intense few weeks of classical guitar playing, he finds it very relaxing, and enjoyable, to just play whatever he feels like. This can be old favourites, which he will also sing along to, or occasionally, we challenge him to make up a song 'in the style' of someone else. This provides us with many happy hours of music making. It's also a need that Robin has. Music is always on his mind, and, it's good for him, and all musicians, to try out new things. Today, however, we had son number two's 5th birthday party. Just as we were all nearly ready, Robin came up with a nice riff, and played it over and over a few times, expanding it slightly with each repeat. We all wandered off, knowing, it may be a while before we could leave. But time wasn't on our side, so Robin quickly put the notes in the computer, for fear of forgetting them, and off we all went for a noisy but highly enjoyable party. Of course, the first thing he did on his return, was to listen to the freshly composed piece, and continue where he left off. We both realised that this often happens on a Sunday. We're not really sure why, but, it could be that when home, this is one of the only free mornings he has. Maybe all this music is floating around in his head until the opportunity arises to release the beast. This particular piece would make an excellent T.V. theme tune. When it's complete I'll have to add it to my ever growing list of pieces of music to promote. All I need now is another few hours in every day. Labels: classical guitar, Composing, T.V. Most people would allow themselves a few days to recover from a long haul flight and the associated jet lag. In an ideal world so would Robin. But it isn't always possible. From experience, Robin has found it easier to adjust, if he stays up until roughly our normal bedtime, and, maybe has an extra hour or so sleep the next morning. So, Thursday evening he did manage to stay awake, even if the conversation was somewhat limited! By Friday he appeared more or less back to normal. Which was a good thing as he had a busy weekend ahead. All private functions, but they still require the same rehearsal, dedication and polished presentation. Today has been particularly hectic as Robin was out this afternoon playing to a very appreciative audience, came home long enough to eat some tea and kick a ball in the garden with some number two, then dashed off out again. I do hope the jet lag doesn't catch up with him tomorrow as it's the day of the party for son number two. This will involve 18 small and noisy children. No matter how tired Robin is, he won't be getting out of this one...not that he would want to. I think he's really looking forward to taking a few hours out to do something completely different. Today we were invited into school for 'birthday assembly'. As you can imagine, it is very exciting for a small boy to stand in front of the school, and show two of his newly acquired birthday gifts, especially as your parents are able to watch. Son number one obviously gets his stage presence from his Dad, as he didn't appear at all phased by proceedings, even when he had to talk to the headmistress about his toys. There was one thing we were both very impressed about. Each week a piece of classical music is selected, and played to the children as they go into assembly, and again when they leave. They are all told what the music is, and, encouraged to listen to it as they wait. What an excellent way to expose young and impressionable minds to some wholesome and nourishing music. This weeks choice was Aria, from Bach's Goldburg Variations. A particularly calm and serene piece and ideal to maintain order amongst a throng of under 7's. We are both very familiar with this piece and it was a delight to sit and listen as all the children filed in and out. It wasn't a version we are familiar with though and I'm afraid I don't know who was performing it on this occasion. However, I do know it wasn't Glenn Gould, as the characteristic humming and singing along, present on all his recordings, was absent. I really had to restrain myself from adding them myself, and, I later found out that Robin was having the same problem. Robin has arrived home from Boston, in remarkably good spirits, despite the overnight flight. He had to hang about at the airport for a while, as I was stuck in rush hour traffic, having deposited two children at school, at the earliest opportunity. However, I eventually made it through the traffic, and whisked Robin away from the airport. Once home we enjoyed the chance to sit and chat, face to face, over coffee. After catching up with nautical tales Robin asked to see the post that had arrived in his absence. I knew that this would be the point that I lost him to the music room. A package had arrived, in his absence, containing music. Robin had ordered it before he went away, and, as predicted, couldn't resist going off to play through it. The piece is 'Sarabande', by Francis Poulenc, which is dedicated to Ida Presti. It's a short, but beautiful piece of music, that Robin played many years ago, and wanted to revisit. It is also the only guitar piece that Poulenc wrote, composed in New York, March, 1960. For me, well, it was just so nice to hear the guitar playing around the house again. Robin was unable to get a 'phone signal, in Bar Harbor, hence the lack of communication. He did however email me to say how nice it is there. He was impressed to find a very pleasant cafe, which played nothing but opera, with signed photographs of various opera singers decorating the walls. As he was enjoying his coffee with the soprano, Annette Wardell, it was particularly appropriate. The QE2 has now arrived in Boston, Massachusetts, another first for Robin, and he will be setting off for home later today. As Robin's guitar concerts have all been performed, and he has nothing to report but the packing of his suitcase, it allows me time to refer you to some new Links. The Canadian pianist, Chris Foley, has been working very hard. Many blogs have been acknowledging his efforts, and rightly so. Not only is he running, 'The Collaborative Piano Blog', which I have recently discovered, and have now added to my links section, but, he has also put together a classical music blogs pagecast. Basically, he has taken all the leg work out of looking around for classical music blogs, with just one click of a button. So, to look at old favourites, or, to discover some new sites, take a few minutes to check out, 'Chris Foley's Pageflakes'. The QE2 is about to dock at Bar Harbor, Maine, USA, but I haven't heard anything from Robin as yet, so I assume he is still sleeping. I'm pretty sure he will be going ashore, to have a look around, as it is another 'first' for him. Whilst waiting for news from abroad, I decided to check in on David Juritz's epic journey, as he busks his way around the world. Since I last looked, he has been touring extensively around Africa, Australia, briefly back in the UK, and is currently in the USA/Canada. Robin and David will miss each other by 10 days, in Boston, but I did notice that they will both be in New York at the same time later on in October. Who knows, maybe they will bump into each other, and form a busking duo! For more details about David's trip, and the charity, Musequality, visit his site, 'Round the World and Bach'. At some point David did find time to make this very funny film, which highlights just how mad musicians can be! I do hope his violin was insured, but even so, it's a very brave thing to do. Bike worse than his Bach? The last concert on board the QE2, for this trip, went very well. Robin was pleased, and relieved, as it was the first time he had performed this particular programme. It is always a little more nerve wracking, when performing a new programme, as there is always the fear that a memory lapse will occur at some point. However, that wasn't the case, and both Robin and the audience enjoyed the concert. He did have a minor nail problem, when one became 'unglued', but this was quickly rectified, and the audience quite amused by proceedings. He allowed himself 15 minutes on a sun lounger to relax, before setting off for the gym, to add his pedal power to the ships engines. Last night he went to see the soprano, 'Annette Wardell', and thoroughly enjoyed the performance. They spent some time chatting and Robin is now working on a string quartet arrangement of 'Cavatina' for her. So that could be interesting. Robin was obviously in socialising mood, as he got talking to a chap that remembered meeting him 25 years ago, at a concert in Luton. It started when he was telling Robin how impressed he had been to see his book, 'The Guitar Gymnasium', in New York. They went on to discover that they had some mutual acquaintances, so were able to fill each other in on the last 25 years! I had an email from a gentleman who was very complimentary about the blog and has been following the QE2 on its journey as he has a friend on board. I've told Robin to look out for her, and was delighted to get some feedback from a reader! The QE2 has now docked in Halifax, Nova Scotia, so I'm sure Robin will be going to have a look around. As his work is now complete on the QE2 he will be able to relax and enjoy it.